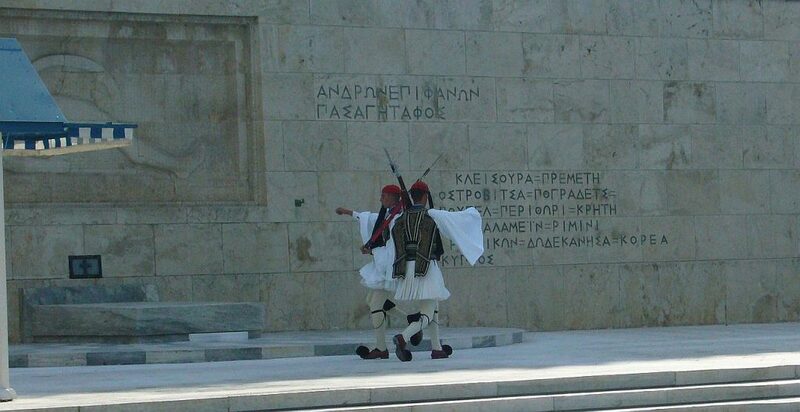 The War of Greek Independence, sometimes referred to as the Greek Revolution, began in March 1821 and lasted until 1832. Most of the area known today as Greece had been occupied by the Ottoman Turks since the fall of Constantinople, now called Istanbul, in 1453. That’s not the only name change the city has experienced. In 330 AD the Roman Emperor Constantine took over the city of Byzantium – a major crossroads then as it is now between East and West – and established it as the new capital of the Eastern Roman Empire. Byzantium became Constantinople, from the Greek meaning the city (polis) of Constantine. It seems it made better sense for the Romans to wield their power in the Eastern Mediterranean and the Aegean from a more central position. And powerful Constantinople certainly was. In addition to its most advantageous location, the city had abundant wealth and was a significant cultural and academic center. Every major religion was represented, every school of thought, every profession and every calling. Every ethnic group and virtually every language then spoken found its way at some time or another through the centuries to Constantinople. 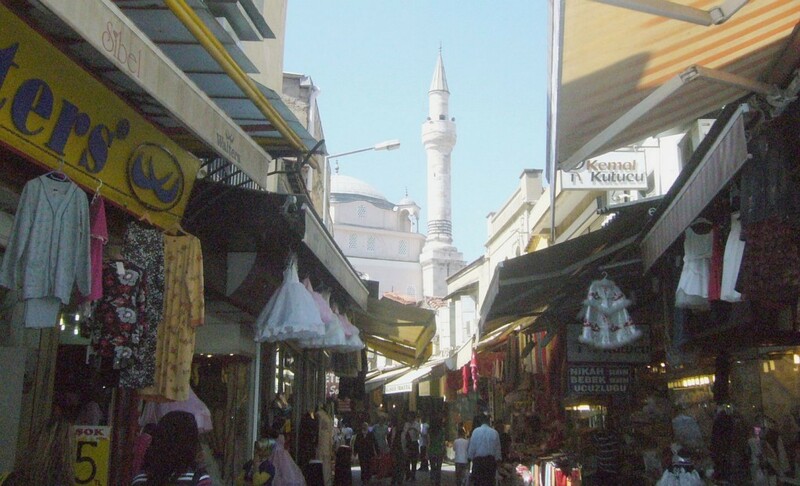 Famed and fabled Constantinople attracted the kind of attention that few other cities could boast of. The Ottoman Turks controlled almost all of present day Greece for 400 years, with the exception of the Ionian Islands held by the Venetians, and the Mani Peninsula of the Peloponnesos. A long, long time during which the Greeks never lost their language. I could rattle on at great length about this period – the fascinating subject of countless tomes and theses – but you can read up on it if you’re at all interested. The Greeks had made many attempts over the centuries to overthrow the Turks. The Peloponnesos, a thorn in Turkey’s side since she first invaded Greece, finally declared war on Turkey on the 17th of March 1821. The conflict was long and brutal. The Greeks had their allies and the Turks theirs. Great Britain was one of the countries that came to the aid of Greece; some accounts have tended to romanticize her role – Lord Byron’s involvement in particular with his tragic death being a factor. Byronas, as he’s called in Greece, is a national hero who is celebrated throughout Greece for his determined efforts in the Revolution, literally dying for the cause. Many boys are named for him, as are streets, squares and buildings. 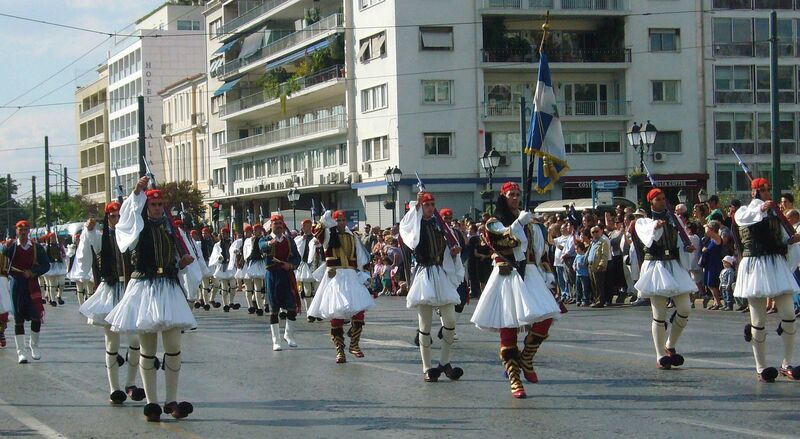 March 25th is a national holiday in Greece, marking her independence from Turkey. The day is a joyful one. Parades take place throughout the country, from simple flag ceremonies in small villages to major parades in cities. 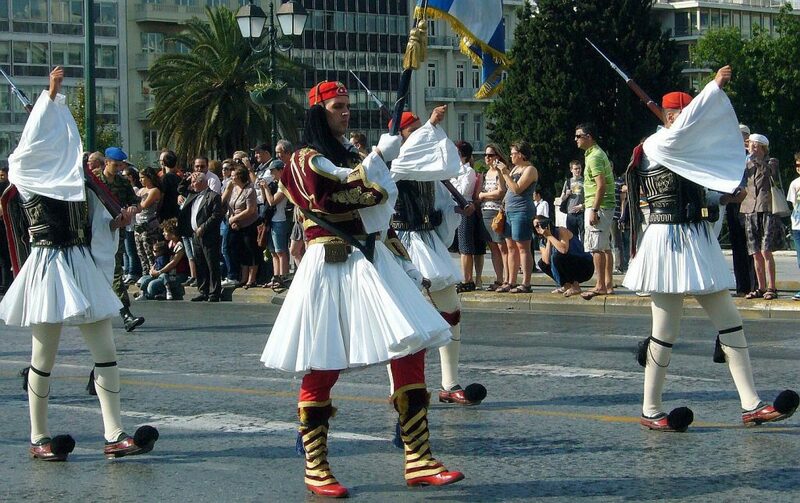 Proud schoolchildren and various cultural groups wear traditional costume, while the blue and white flag of Greece flutters from hands, banners, buildings, balconies, and just about anywhere a flag can be hung or stuck into a holder. Happy gatherings celebrate the day and if the weather decides to play nice – for winter’s nearing its end – the festivities are even more fun. 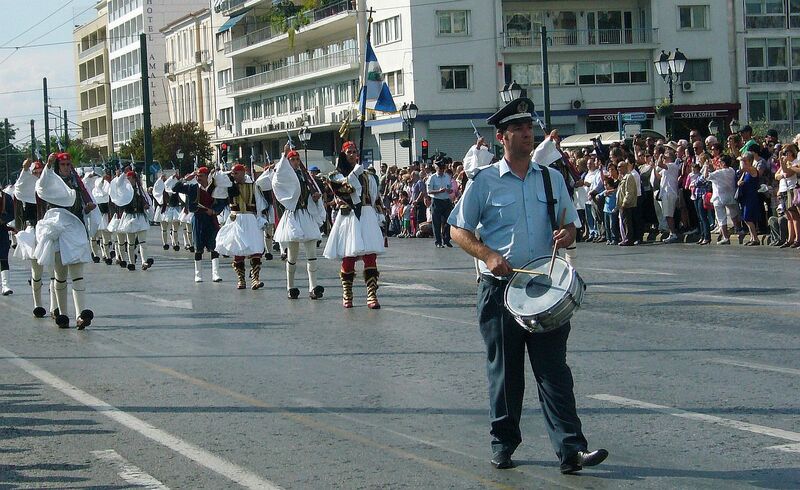 The Independence Day Parade in Athens is an elaborate affair, complete with military displays and ponderous speeches by an assortment of bigwigs – in other words, it’s typical of this type of thing. 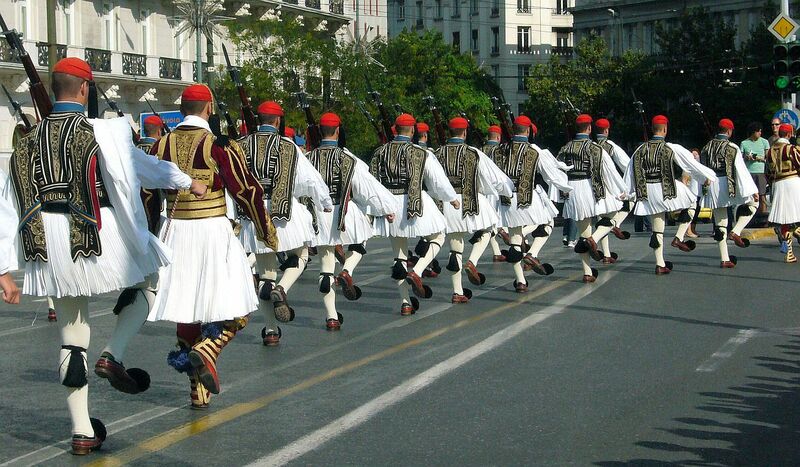 What’s noteworthy though is the march of the evzones, the elite Presidential Guard. In every video of the Independence Day parade I’ve found the commentary is in Greek, so instead I’ve chosen to give you a link to the parade which takes place every Sunday at 11.00. This is quite a display whatever the weather, culminating in the changing of the guard. In summer the temps can be over 100 deg F – the outfit must be murder to wear. If you like a parade, here you go – you may need to copy the link and paste it into your browser. This particular video is very long and not well edited, with a rather choppy cut into the national anthem at the beginning, but it shows the march from the barracks to the cenotaph, the Tomb of the Unknown Soldier in front of the Presidential Palace. 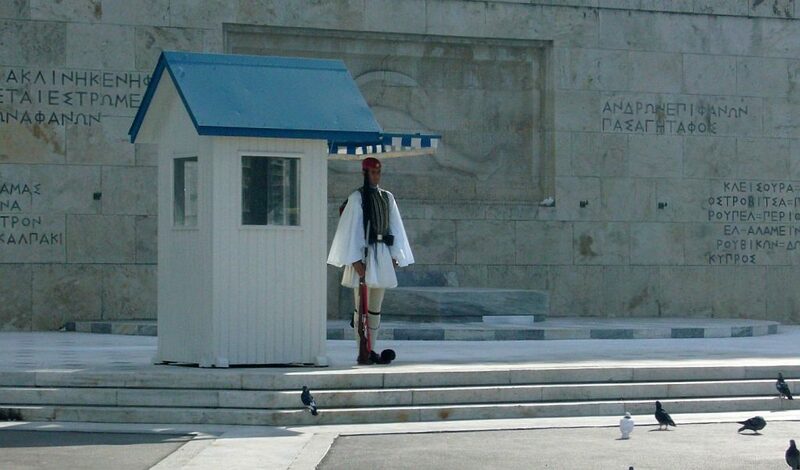 These soldiers are part of an elite unit and are called evzones. This version gives a nice little slideshow if you’re interested. The presidential guard changes on the hour, every hour, all year round in front of the cenotaph, but it’s only on Sunday that the full parade takes place. As you can imagine it’s quite a tourist attraction. This video is quite interesting – the maker gives a little commentary; I must point out though that the guard changes every hour, and not every two hours, as he says. 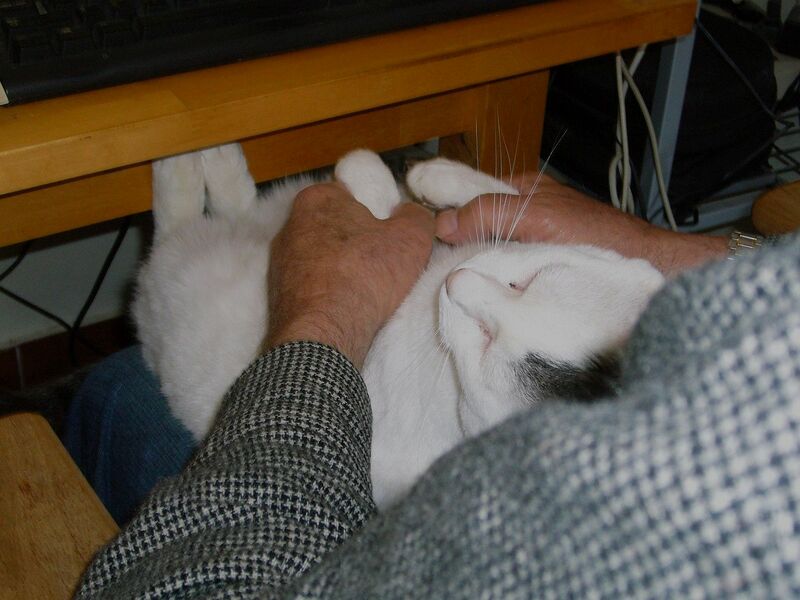 Many of you know that Raki is a much adored, much indulged cat who genuinely doesn’t appear to know he is a cat. We fancy that he believes himself to be one of us. Like us. He certainly has no idea how to interact with the other cats of the household, and holds himself aloof from them. Perhaps this is because he was hand-reared, but it also has to do with his personality. 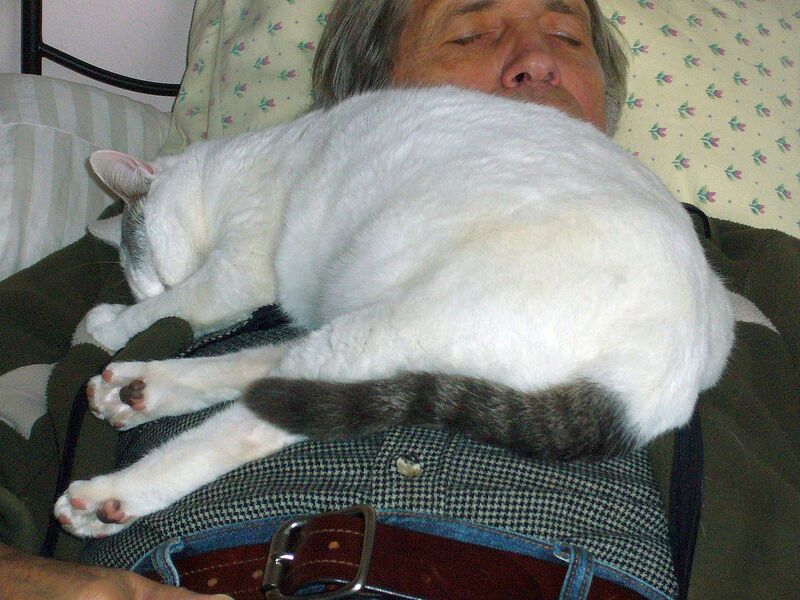 Cats have been part of my life, all my life. There’s a photo of me sitting up in my pram in Scotland – one of those gorgeous large carriages, all wood trim and huge wheels – with a tabby cat asleep at the foot of it. 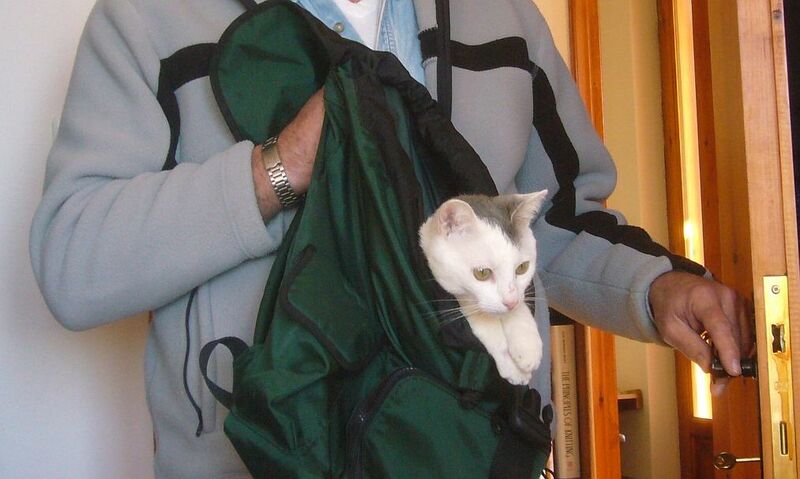 I adore cats, I like to think I understand cats, my childhood home was filled with cats. I was enthralled by the stories my Mother told me of cats she had owned, of cats she had known of, of cats which had featured in tales she in turn had been told in lands far away and foreign to me at the time. Raki is unique. 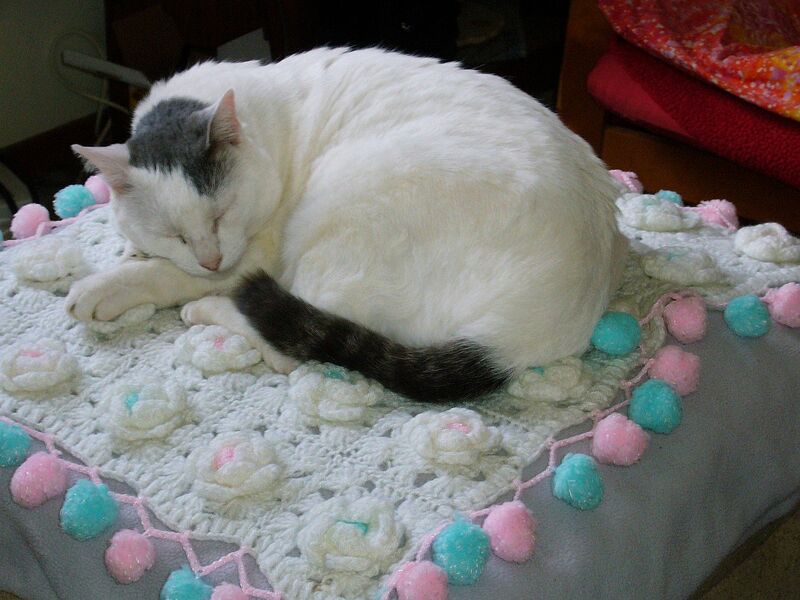 Not because we are besotted with him, not because we are slowly going dotty, but because of his behaviour which enchants all who see him, even those who are not typically lovers of cats. 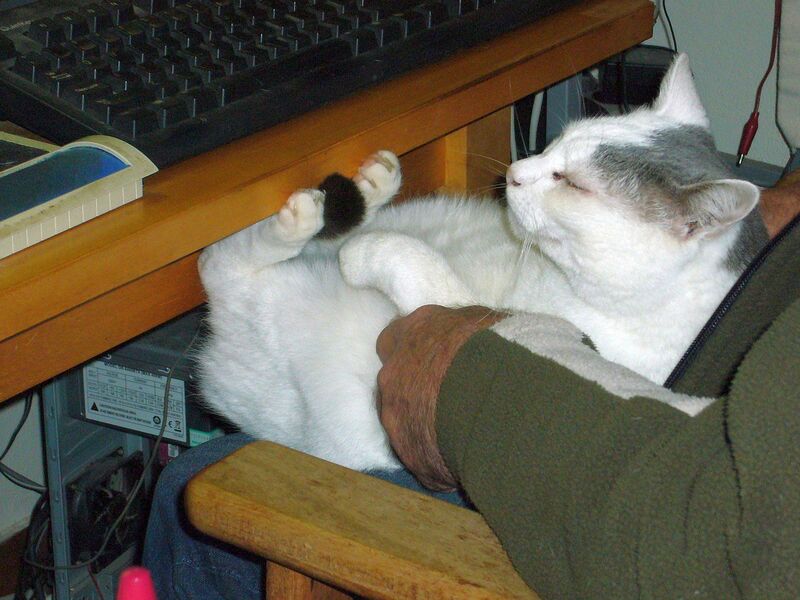 It’s often said that cats are standoffish, that they aren’t faithful and companionable like dogs, but that can never be said of Raki. He’s deeply affectionate, has the most delightful quirks, and is devoted to us, particularly to Ron. He’s always very close to us, following us everywhere; we never have to search for him. A few weeks ago, Costa’s daughter came down from Albania to visit her husband who is working here on the Pelion Peninsula, and accompanied him daily to assist with his work in the fields. 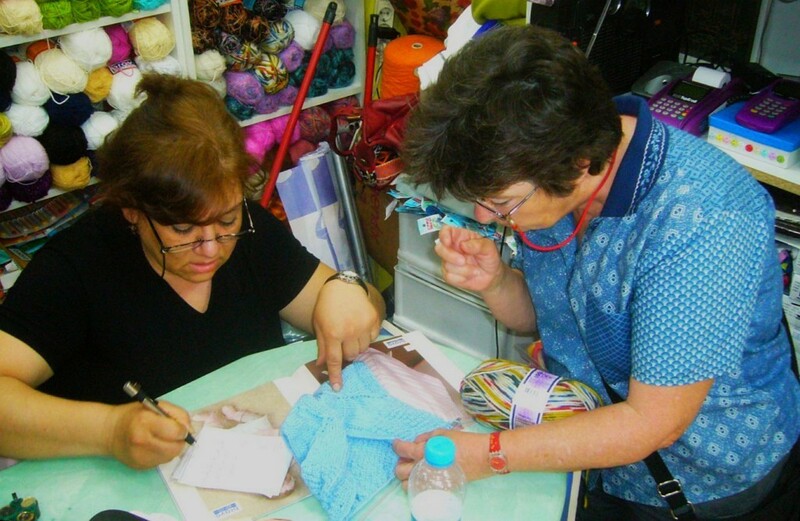 Marieklena speaks little Greek, but she speaks the language of yarn. Fluently. 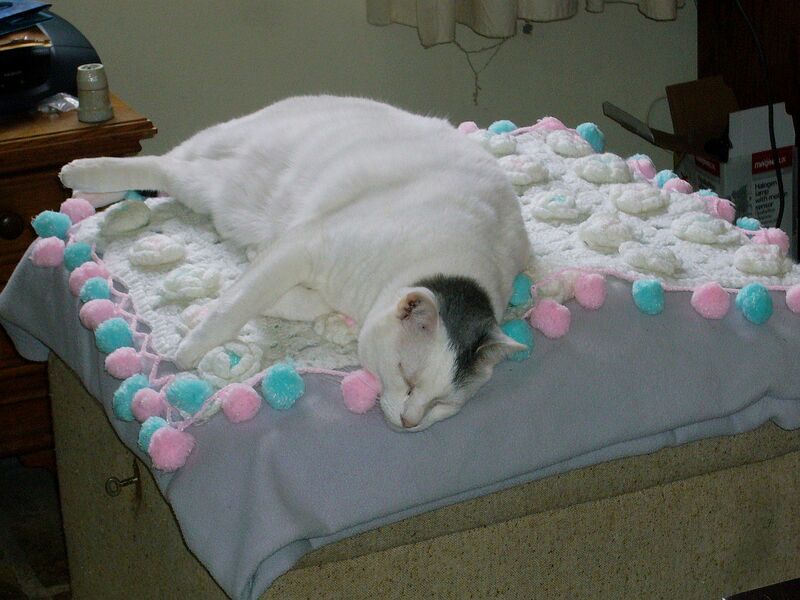 Her workworn hands were busy every spare moment in the evenings; crochet is her thing, and she’s an expert. 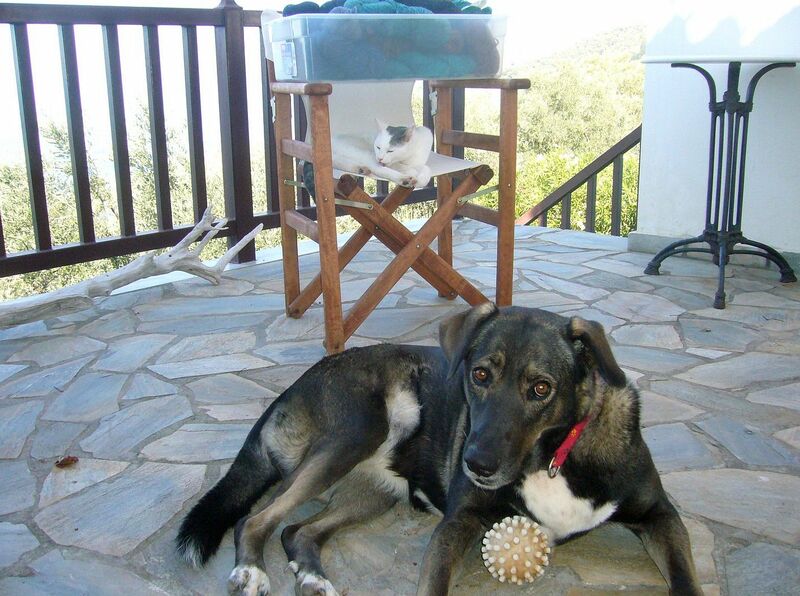 Marieklena was charmed by Raki, and told us of other Van cats like him in Albania, for of course these cats came to Albania from Turkey as they did to Greece. She returned to Albania with hubby Freddie last week – a few days break for him to see his children. Freddie came back last night, bringing gifts from the family – Costa’s extended, generous and gracious family – but the most important gift is for Raki. 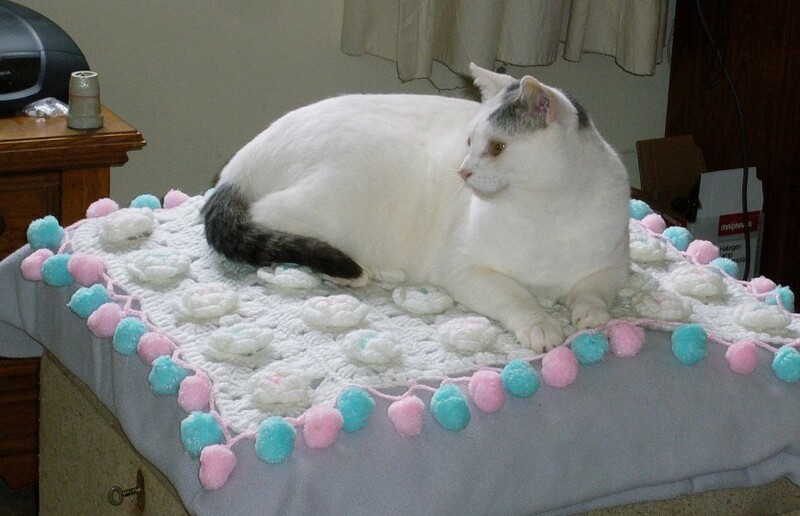 Mariklena made it, and sent it with explicit instructions that it is only for him so that he might sleep on bedding fit for a sultan, which is what we occasionally refer to him as. Freddie explained that Mariklena made the pompons* so that he’d have something to play with. I admit I was overcome, and clearly so was Raki for he wasted not a minute climbing on it when I spread it out, and fell instantly asleep. 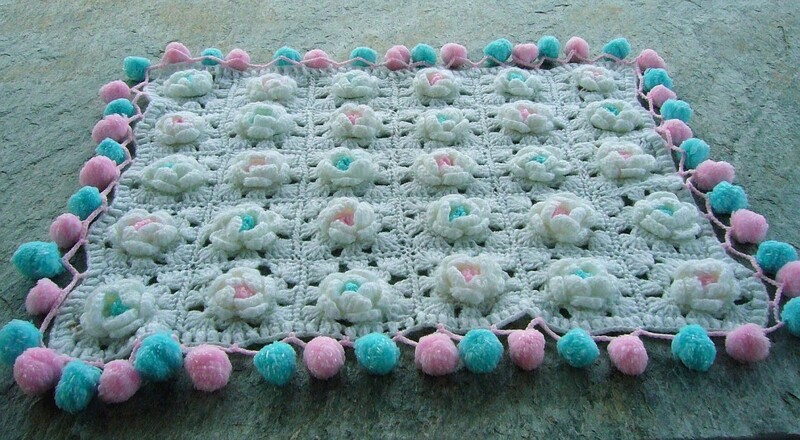 * Apparently the pompons are created on a wooden device, hand carved for the purpose, which is traditional in Albania. Mariklena uses a very old one made by an ancestor of Costa’s family. Such an item is new to me and I can’t wait to examine it. 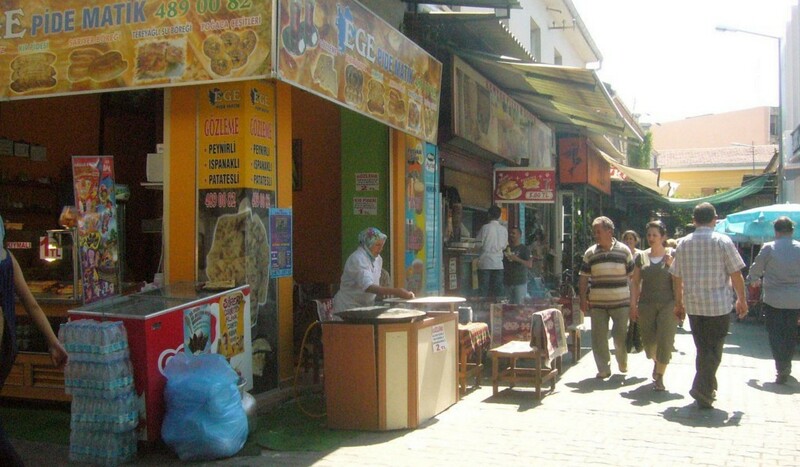 Turkey’s larger towns and cities have many sophisticated stores and boutiques where the shopper, whether a local resident or tourist, is presented with an abundance of the goods to be found in such surroundings. Designer clothing, sumptuous rugs, antiques. Tantalizing temptation! But for me, the street markets and covered bazaars do it every time. They are so enticing, full of weird and wonderful objects, the everyday and the exotic, paper tissues and cloth of tissue, jeans and jewellery. The buyers and sellers alike are fascinating; visitors are from far and wide; dozens of languages are heard, mingling with the sounds of bells and music. Tiny shops selling sweet-smelling spices nestle between the textures and vibrant colours of handwoven carpets, rugs and other handworked textiles in adjoining enterprises. It’s knitting that invariably catches my eye. 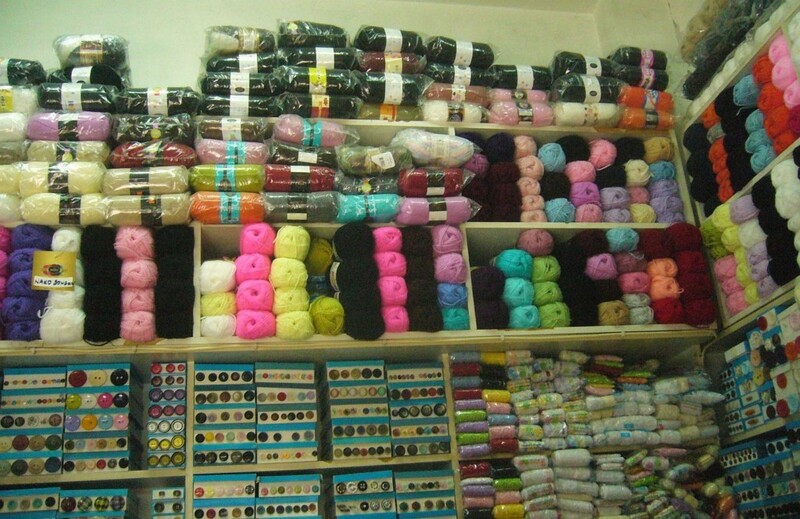 Anything knitting related, be it the handknitted socks which pop up here and there in various shops and stalls, or knitting yarn. 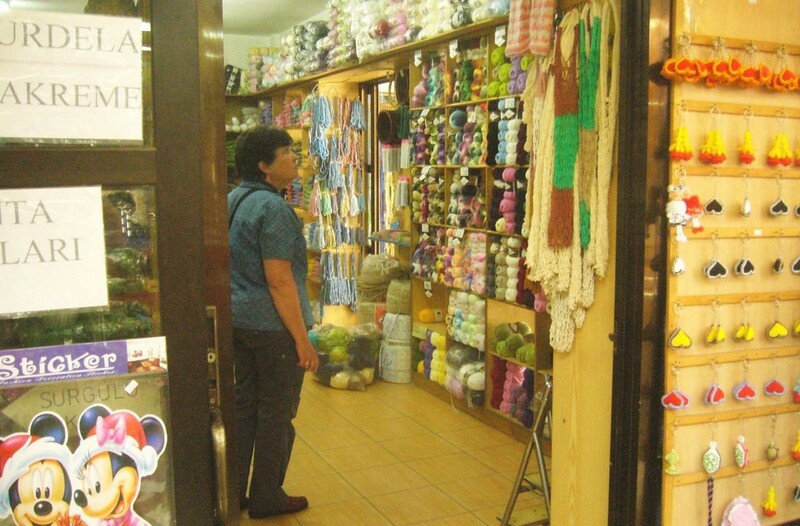 Although stores here do a brisk trade in clothing of varied quality, much of it imported from countries like China and Taiwan, handknitting is still popular, and domestically produced knitting yarn is widely available. 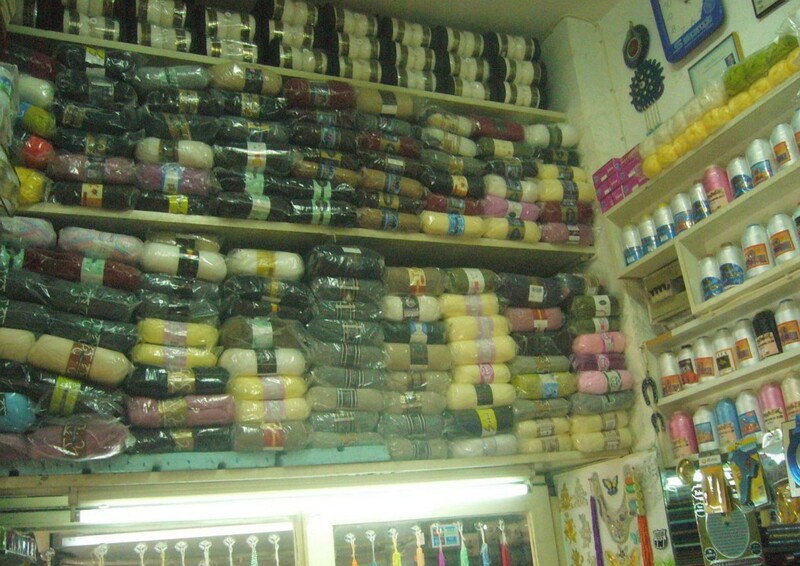 You will often find a small selection of basic yarns in the typical haberdashery business. 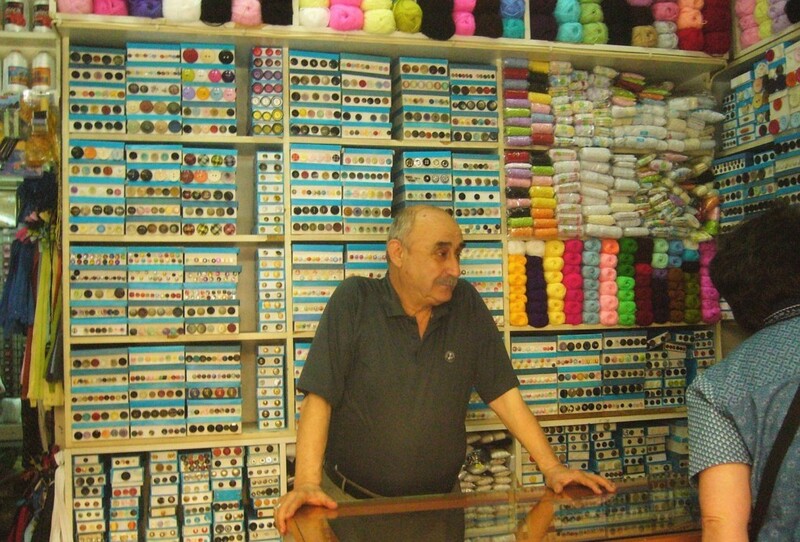 These little shops are bursting with threads, buttons, zippers, needles of all types, sewing tools and gadgets, notions and trims – an amazing selection of items for those of us inclined towards the needle arts. Displayed on shelves reaching to the ceiling and expertly retrieved for your inspection by the owner or assistants, tucked under the counter, stored in the back or even fetched for you by some runner urgently dispatched to a fellow dealer, the goodies are many and varied. Whilst we communicated only by gestures and much pointing on my part, the owner of this establishment was extremely courteous and helpful, even though my purchase was tiny. The hospitality however was huge, as we have often found it to be in Turkey, and sweet tea, always served in glasses, was immediately sent for. 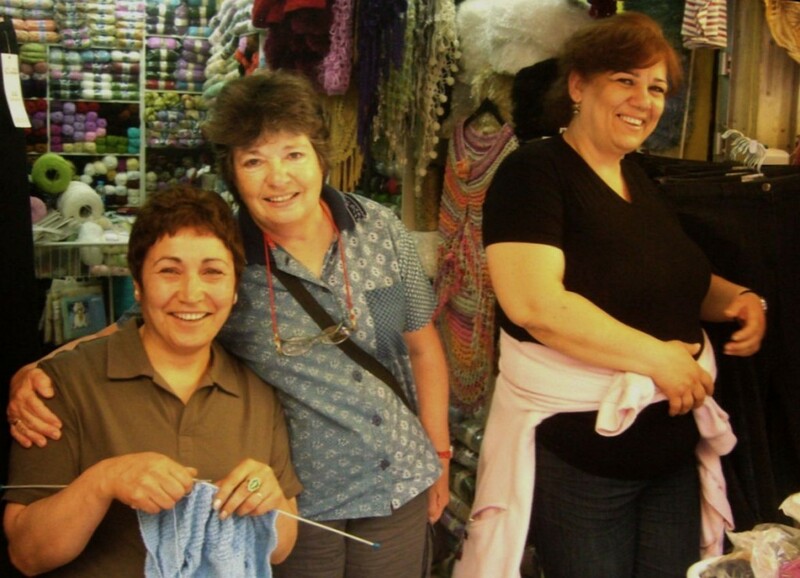 Later in the day we came across a shop pretty much devoted to knitting – owned and run by two charming ladies who are either sisters, or mother and daughter. 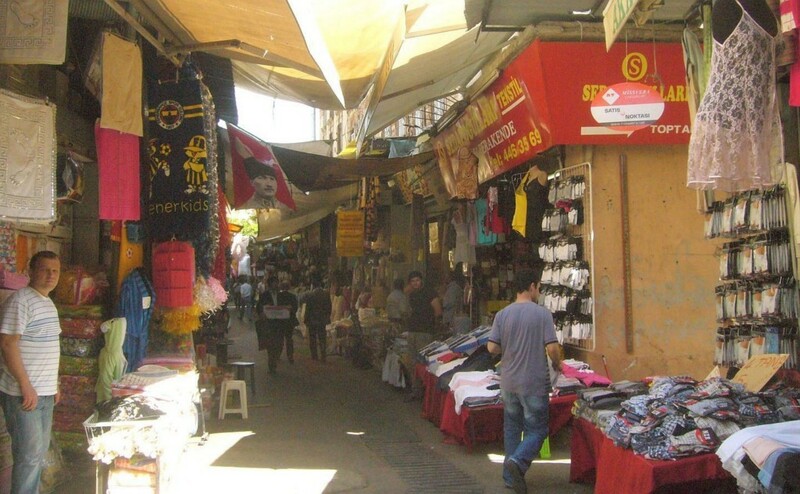 I couldn’t quite establish the relationship and as we were a little off the typical tourist part of this particular market, there was no helpful local to translate for me. No matter. 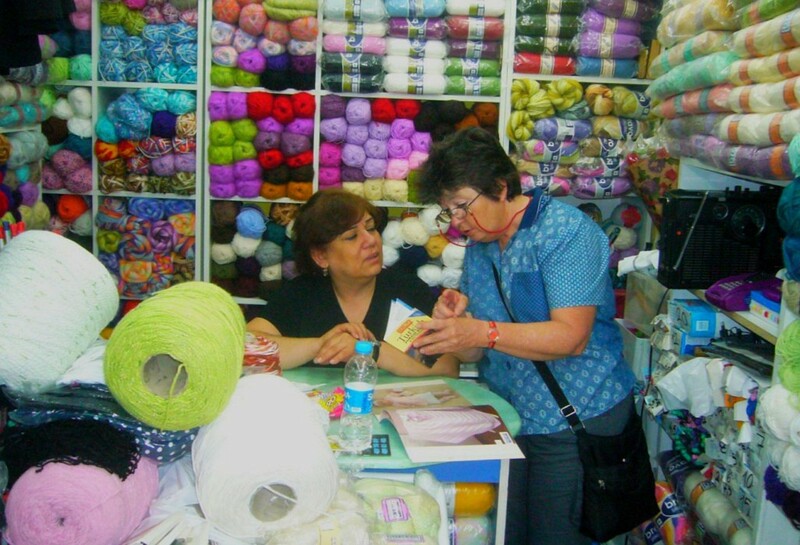 We spoke the universal language of knitters and got along quite happily. 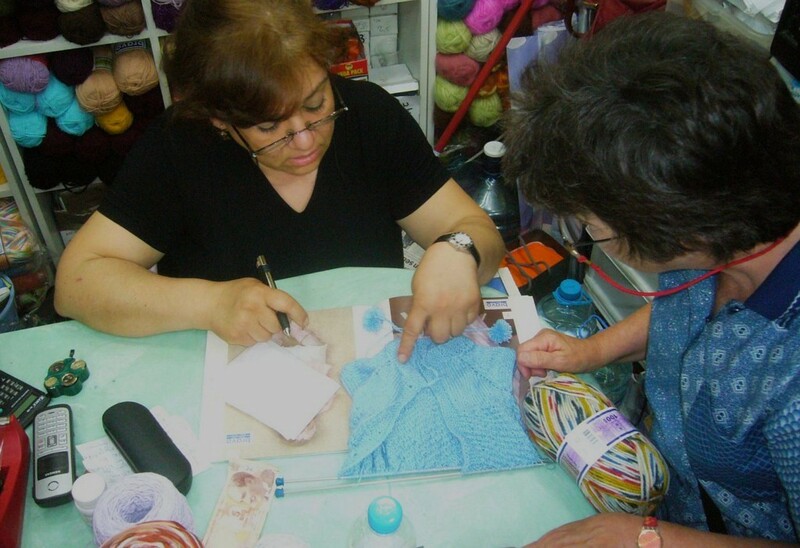 As you see in these photographs, the knitters were very excited about a recently published magazine pattern they were working on. They were most anxious to show me the baby jacket, knitted from the top down, a technique which we in America are familiar with, but one completely new to them. 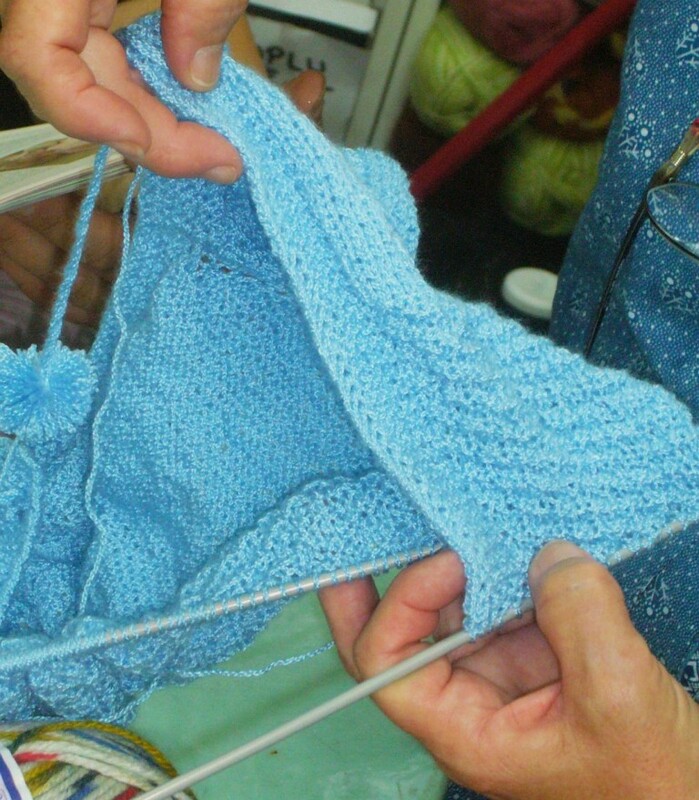 What was so touching, and so typical of the generosity of knitters, was their determination that I too should learn this method and all of its advantages, in spite of the fact that we had not one word of common language among us. I not only hadn’t the heart to tell them I have made several items this way, but I quite literally couldn’t. 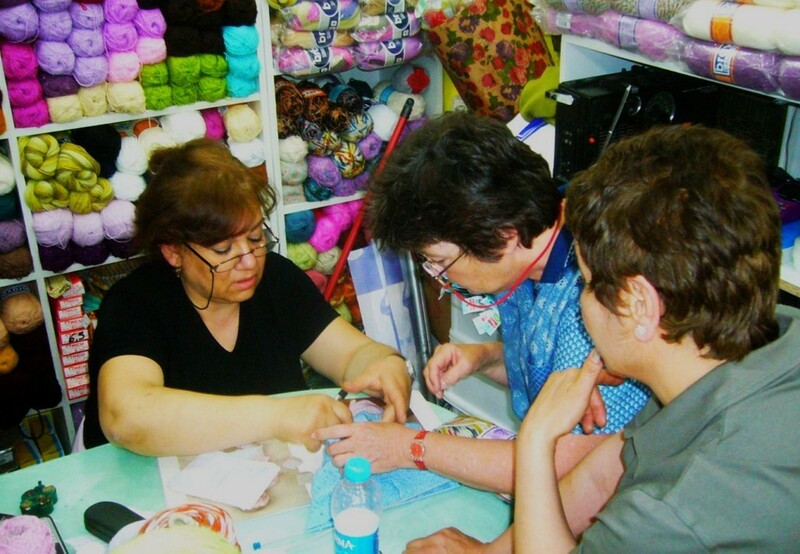 Here are the ladies explaining the pattern to me, and going to enormous trouble to write down some pointers, bless them. In Turkish yet! They were so enthused about the process, and so eager for me to benefit from it also. We had a grand old time, babbling away, trying to find words in my tiny pocket dictionary, which was not exactly encyclopaedic with regard to knitting terms. I will never forget them, how genuine and cheerful they were, their generosity in sharing. They spoke for knitters everywhere. The Pagasitic Gulf has a fairly good natured temperament, but as the saying goes, still waters run deep and in this case they do quite literally for the Gulf’s depth is about 100 meters in most parts. Though usually calm, the Pag can be moody, showing flashes of anger just when least expected, particularly after Poseidon decides to get his trident in a twist. Rather high and mighty is Poseidon, conscious of his position as one of the Twelve Gods; his realm is the sea and he’s a touchy character. Very. Poseidon is quick to take offense, and even quicker to vent his fury, striking his three pronged weapon to cause earthquake and tsunami, shipwreck and drowning. 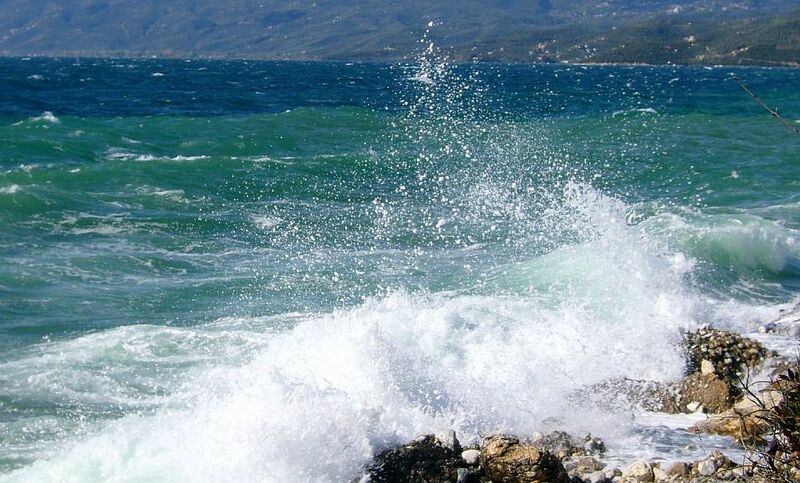 For my part I’ll take his raging seas any day rather than his earthquakes. 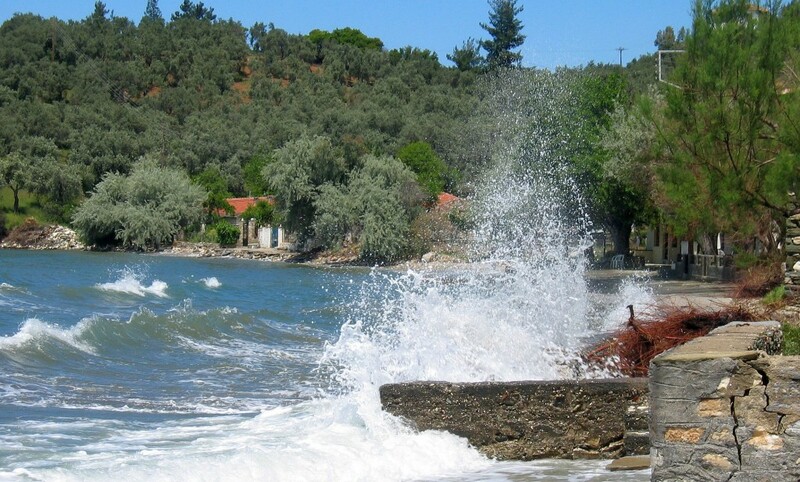 The waters of the Pagasitic can boil up in no time, frequently subsiding just as swiftly, but when Poseidon’s tantrums are out of control, the sea might rage for days, depositing all manner of debris along the beaches and among the rocks. Plastic, that prince among pollutants in all its forms, nets, ropes, wood, medical waste bearing foreign labels and doubtless dumped at sea, bottles, branches, logs, shoes, clothing, toys, to name but a few. 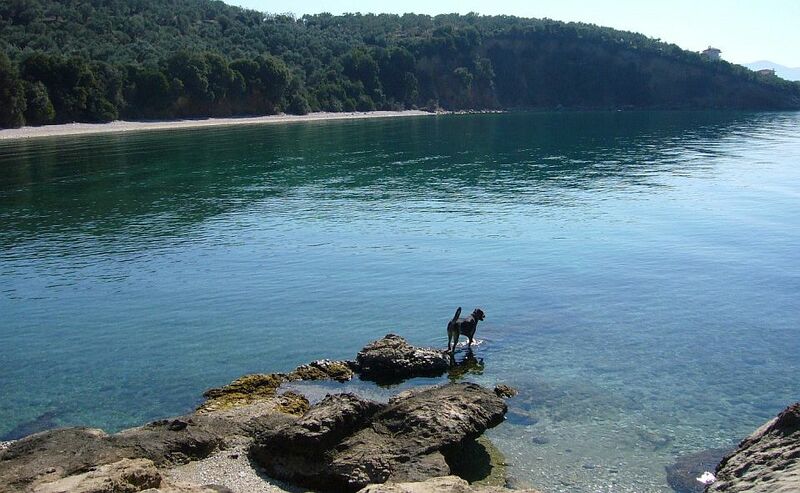 My dog Sophia, keen swimmer and beachcomber, supplemented the toys we constantly bought her, by retrieving various playthings and balls from the tangled messes hurled onto the shore. 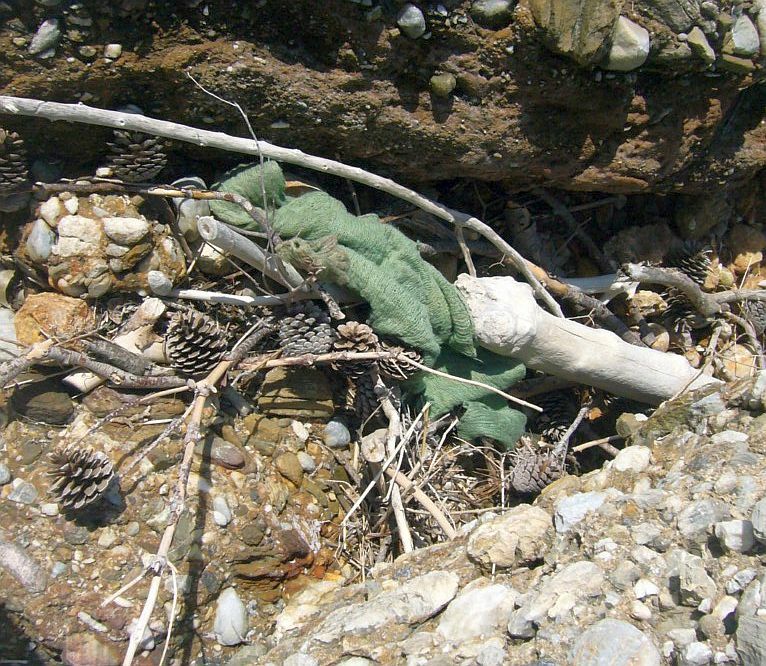 After one particularly fierce storm when Poseidon was completely out of control, I noticed a piece of green knitwear twisted tightly around some vegetation. Intrigued, I retrieved the mangled bundle and set about separating the knitting from the twigs and pine cones, burrs, thistles and bits of root gripping it. 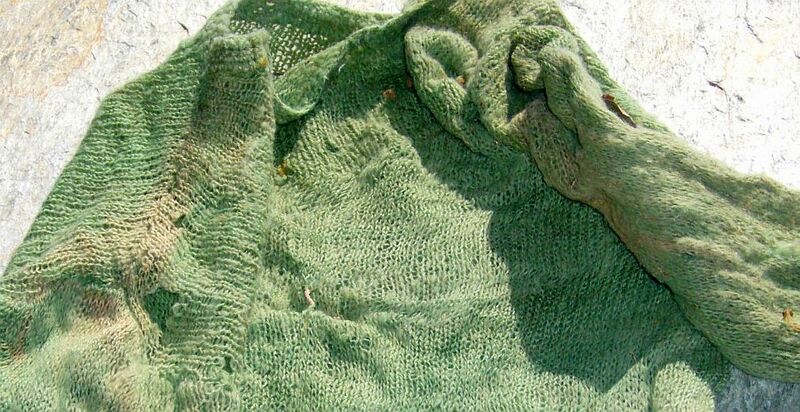 A very damaged, hand knitted sweater was finally freed. I was rather upset at first; it was difficult not to think that maybe a life had been lost. But then again, why should that have been the case? It could just as easily have been blown overboard, or accidentally dropped into the sea. Or been swept by a wave off the beach. Washed away in a heavy rainstorm. What about the person who’d lost it? Was it their only sweater? Sophia and I walked home, and I placed the matted little heap on a table to dry in the sun. The next day I picked off some of the seed pods stuck all over it. This sweater has been in the water a long time. It’s faded in parts, badly ripped, it’s brittle and disintegrating, but it has a story to tell and I’m trying to understand it. There’s a temptation to indulge in a flood of metaphor and sentiment with regard to it, with waffle about unraveling and dropped stitches, and being battered by life, about what it was and what it no longer is, but the fact remains that someone went to the trouble of making it, and somehow it got lost. The fact remains that it’s handknitted, and that one seldom sees handknitted clothing here any more. The street markets in Europe have seen to that. So where did it come from, this little sweater? And by whose hands was it made? The yarn is wool, it’s quite badly degraded, but it appears to have been handspun. 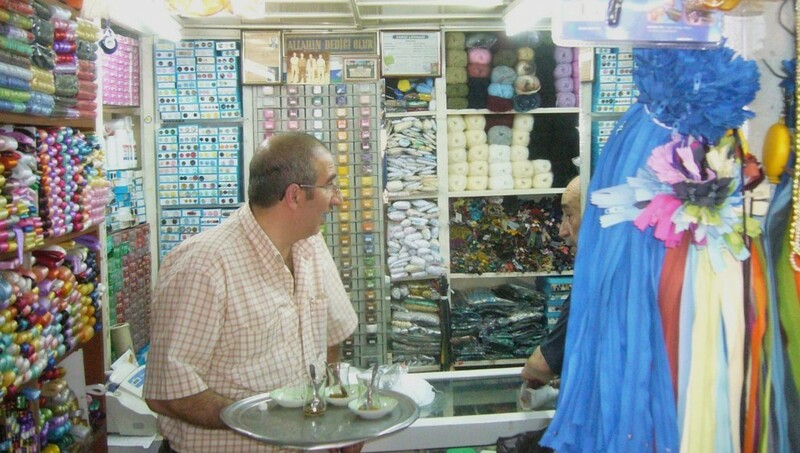 This makes me think of Albania where I know women who spin beautiful yarns on drop spindles to knit for their families. The garment is knitted back and forth in pieces, which have been seamed together; the sleeves are set in; the neckband is crocheted. 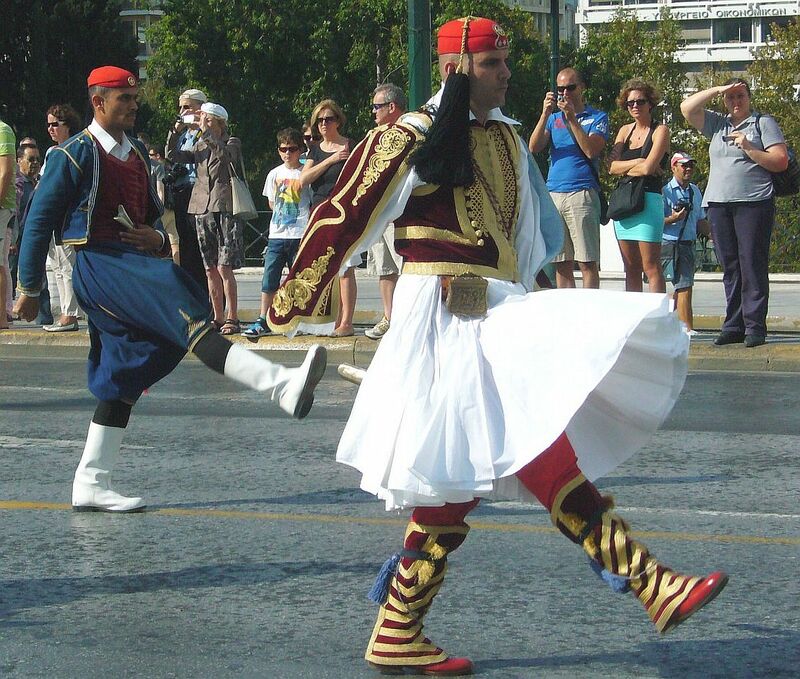 The yarn has been held double at all the cast on edges – a technique commonly used in Greece, Bulgaria, Albania, Turkey and parts of the Middle East. A close examination reveals no damage to the cast on edges, which is interesting in that other areas of the sweater have been torn. The cast on stitches are fairly rigid, they have very little elasticity, which again brings Albania to mind. The workmanship would win no prizes, but this is a utilitarian garment, made to serve a need. It is not the work of privilege, if I may phrase it so. The hands that drew upon age-old knowledge and techniques to make it, that did so with love and concern, created a garment that links all those of us who knit. Who knows how far it’s traveled? immediately my trusty little helper leapt onto it. 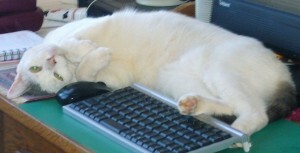 Introducing Raki, a cat of dubious parentage, but of impeccable taste for the finer things in life. 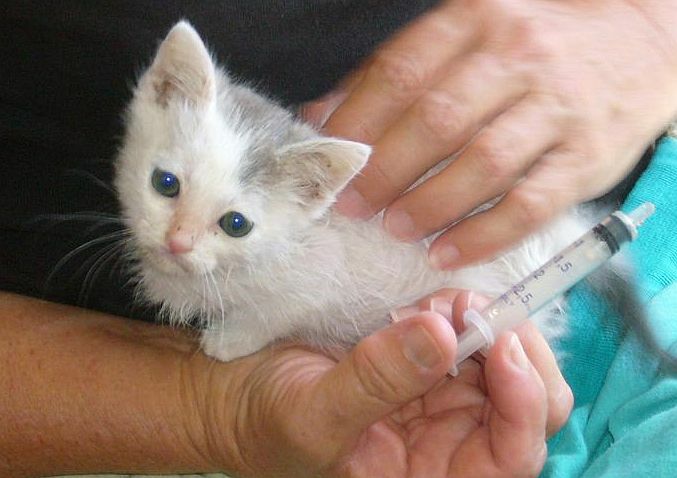 He is a Van cat, a breed known for many centuries in the Lake Van region of Turkey. His ancestors would have been brought to Greece at least at the time of the Ottoman Occupation, but probably well before then by Crusaders, traders, pirates and various others who journeyed for whatever reasons across these parts. Raki is now 6 years old, named for the Turkish drink Raki which turns white when added to water, and found by us 3 days after the Argo replica sailed. 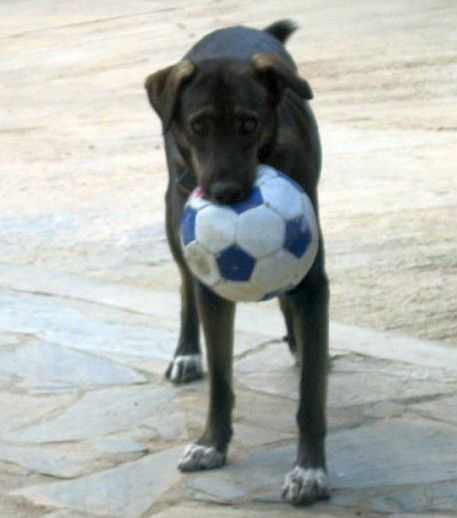 We were crossing a supermarket car park in Volos when he caught my eye. Pitiful. There is no other word. Pitiful. 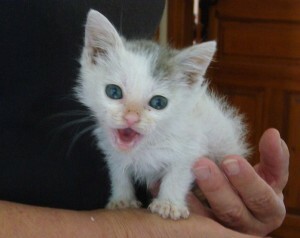 Under a car, in the blazing heat, tiny and filthy. He would not have lasted through the day. I scooped him up. Husband was not thrilled…cats we have a-plenty. hourly, day and night, on a mess of baby porridge, water, evaporated milk and a scraping of yoghurt, squirted all over us both in a syringe. Why the yoghurt? I had some notion that it would provide healthy bacteria to his horribly disturbed digestive tract. His belly was huge, hard, round as a tennisball. Worms. But he was too young and weak to deworm at that time. He had sparse hair, was very dirty and riddled, absolutely crawling, with fleas. 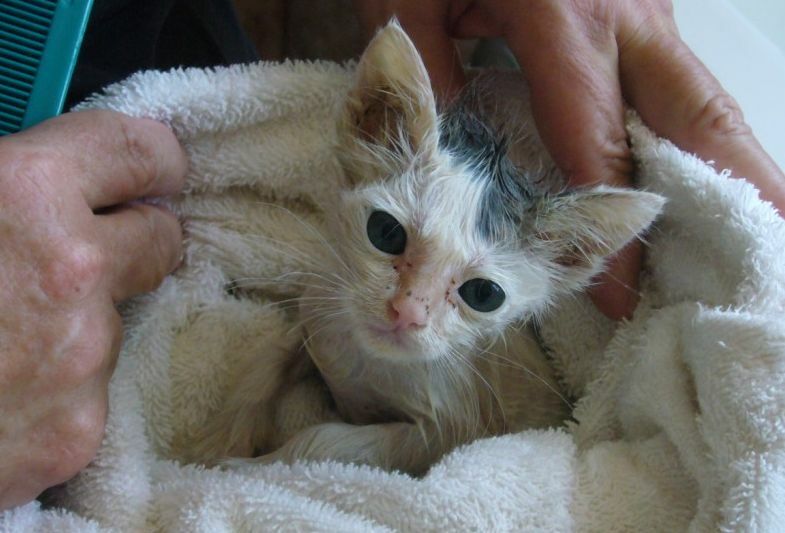 His ears were full of mites, and his little body had numerous bites. He was a sad and sorry-looking soul, all big eyes and ears. I bathed him in baby shampoo – had to do it twice, so dirty was he and so numerous the fleas, their eggs and other detritus. He objected. Loudly. But I was thrilled to hear that feistiness! These photos were taken almost immediately after he came into the house, but even then he was establishing his place in the order of things. Or maybe I should say our place in the order of things. He is like no other cat I have ever owned, and I have had cats all my life. 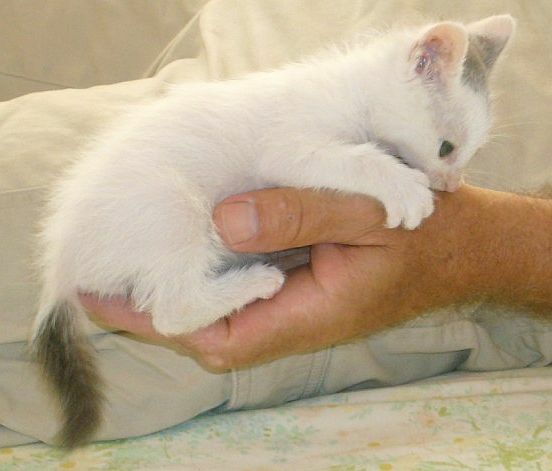 It’s not just his physical characteristics, for his fur is unlike that of other cats – it’s a dense pelt, soft as silk and only one layer of hair. 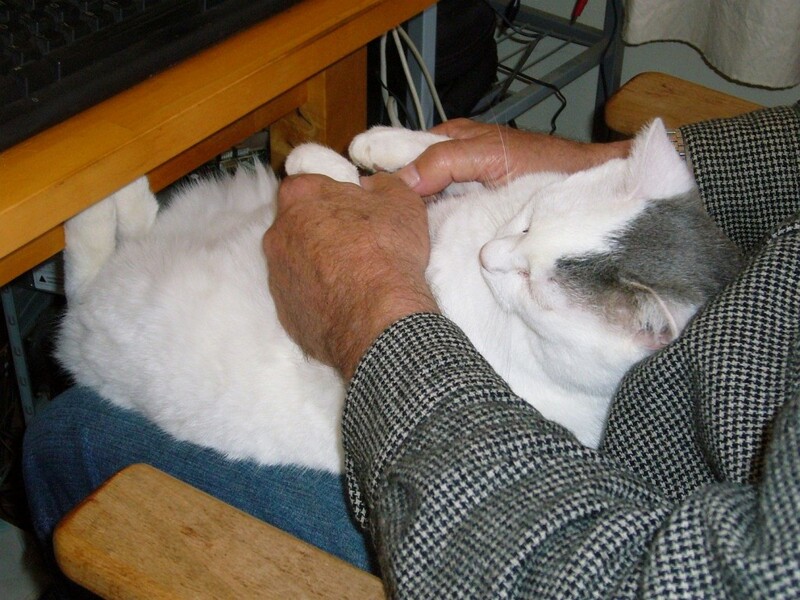 He seems to be self-cleaning in that his fur never gets tangled, in spite of his mad adventures through the garden, the olive trees, and the indigenous vegetation on the property. 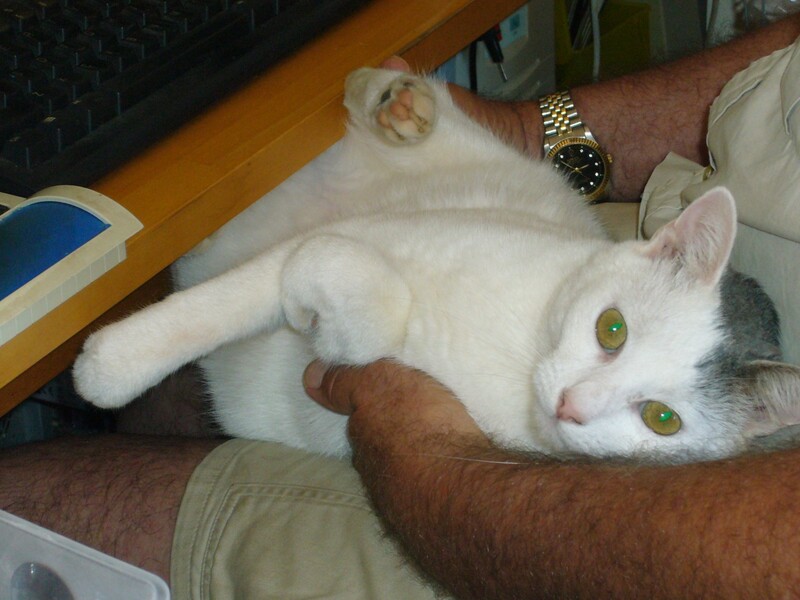 He is extremely energetic, playful and fearless and shows absolutely no sign of the more sedate behaviour of the other cats, all of whom become impatient with him very quickly. He loves water and considers it an obligation to assist us in the bath or shower. But it’s his affection and devotion that make him truly special. He is ever-present. It’s as simple as that. He accompanies us and our dog on our walks, often having to be carried back when he gets too tired, he involves himself everywhere and all the time, he’s vociferous, inquisitive, determined and very loving. Oh, and Husband adores him.